Rhyme, rhythm, and music are an essential part of a quality early childhood program. The authors of the perennial favourite, Where is Thumbkin? 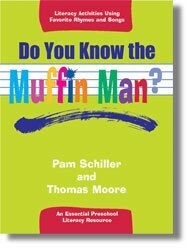 have created activities children will love to accompany the 250 rhymes and songs in this invaluable new literacy book. Children learn letter recognition, vocabulary, phonemic awareness while they are singing and rhyming. Each rhyme or song includes theme connections so teachers can easily add literacy and music into their daily plans.